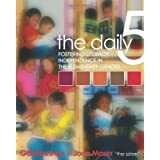 During this past week I began re-reading the book written by Gail Boushey and Joan Moser titled The Daily Five: Fostering Literacy Independence in the Elementary Grades. My first reading was five years ago and I decided to refresh my memory a little on some of the characteristics of using The Daily Five in the classroom. I have fostered independence in my classroom and this year I aim to fine-tune my students’ independence. Hopefully a re-reading of this book will help me do so. This sounds like a great plan for the classroom. It does work well. And when the children are working independently, I able able to work with individual children or small groups. Glad it works for you. It’s an interesting concept. Was it hard to implement? The trick is teaching the children to work independently. Plenty of repetition and reviewing lead to the children enjoying the choice they have and behaving appropriately. A good read for all instructors. I’m a fellow 7th grade ELA teacher who’s doing her best to foster literacy in a 45-minute class period. Your ideas and insights for how to do this well have been game-changers for me. Thank you for always sharing. Looking forward to reading your books! If you are on Instagram, you can follow me (collinekc) as I post almost daily what I am doing in my classroom. On my blog, I only post snippets from time to time.